This past Thursday, the Bell Tower saw a change in pace from its usual quiet ambience, which was lit up with Latin music and the smell of tacos as Chicano Student Programs (CSP) held their annual Chicano/Latino Bienvenida on Oct. 11. From 4-8 p.m., various organizations and resource centers tabled around the area while CSP held a screen printing station and handed out traditional ice pops known as paletas. After visiting seven organizations, students would get tacos catered by El Ojo de Agua. 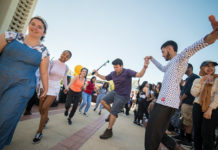 The Bienvenida is an annual event that is a part of CSP’s orientation week, which welcomes new and returning students among staff and faculty to UCR. “We want to celebrate their existence on this campus and honor who they are, their heritage, and their identity,” explained Arlene Cano, the assistant director for CSP. Different student resource centers like African Student Programs and the Women’s Resource Center, and Raza organizations like Latino Union and Mujeres Unidas also table at the event. “We bring all our orgs, friends, and co-sponsors together, so they can all share in the fun. This way they can feel comfortable, and they can know that they can always come to our resource center,” added Alice Chavez, the budget, personal and program assistant for CSP. Throughout the evening, students would dance to songs by Tejano music star Selena blasting from the speakers and watch the live performances of Ballet Folklorico and a banda. After the sun went down, Banda Nueva Generacion began performing as students filled up the Bell Tower square and danced until closing. According to Cano, a banda performance is a significant aspect of the Bienvenida, as it represents traditional Chicano/Latino entertainment. 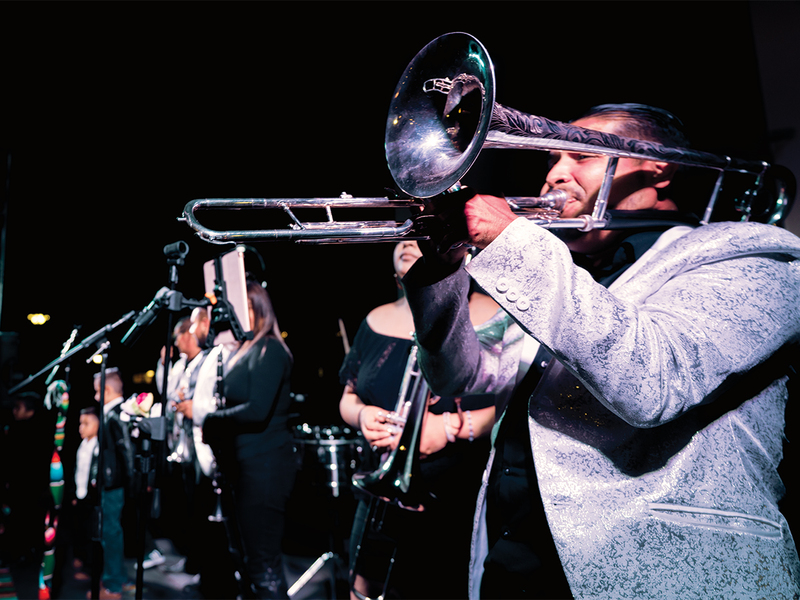 Many students who attended the Bienvenida for the first time were not aware of the banda performance, but, many returning students agreed that watching the banda has become an event that they look forward to every year. Patricia Ortiz, a third-year Spanish major and frequent attendee, emphasized the cultural connection and fun of the event. “Everyone dancing at the Bell Tower when the Banda comes is my favorite part,” Ortiz explained. The Chicano/Latino Bienvenida dates back into the history of UCR. Before becoming an official event, the Bienvenida would be organized informally by students. Now, the Bienvenida has seen a growth in attendance each year with over 500 students attending the 2018 event. Despite the many frequent visitors, a significant proportion of students, including upperclassmen, were attending for the first time. Among these students is Esmeralda Santos, a fourth-year transfer biochemistry major, who heard about the event only this year. 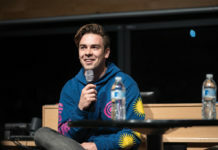 “I’m learning about all these events that they have to offer and I’m kind of mad at myself that I didn’t go last year,” Santos stated. Santos is one of the many student workers in CSP’s mentorship program who staffed the event and has enjoyed the opportunity to share her enthusiasm and experience for CSP with other students. “I’m happy I got to get more involved with (CSP),” added Santos. CSP’s upcoming events include the Adelante workshop series that offer advice and mentorship through student panels and workshops, starting on Tuesday, Oct. 16 from 12-1 p.m. at HUB 260. They will also be hosting a Dia de los Muertos Nooner on Wednesday, Oct. 31 where they will host activities celebrating Dia de los Muertos while a band performs.